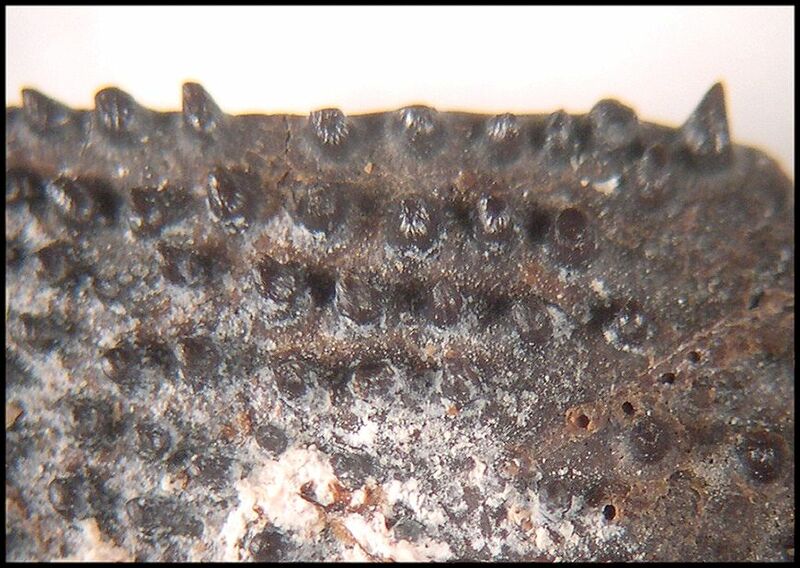 These photos show several views of a portion of a small skull (FHSM VP-17574) that so far has not been identified. 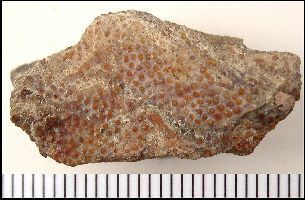 The specimen was collected by Keith Ewell in early June, 2005 in the basal Lincoln Limestone Member of the Greenhorn Limestone (upper Middle Cenomanian), Russell County, Kansas. 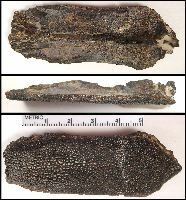 The layer from which it came is a transgressive lag, and contains abundant inoceramid prisms (calcarenite), many small shark and ray teeth, other dis-articulated vertebrate remains, including fish vertebrae and teeth, the vertebrae and a lower jaw of a coniasaur, a fragment of a pterosaur wing, ichthyornid bones and teeth, and paddle elements and teeth of a large pliosaur, Brachauchenius lucasi. Preservation is excellent. 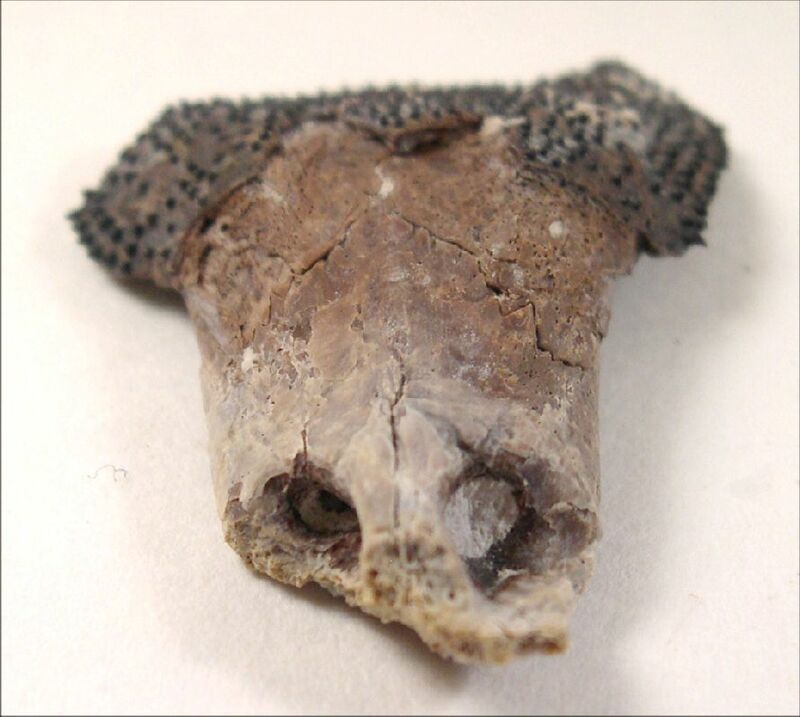 The specimen appears to be the anterior portion (muzzle) of the skull of a small reptile (? 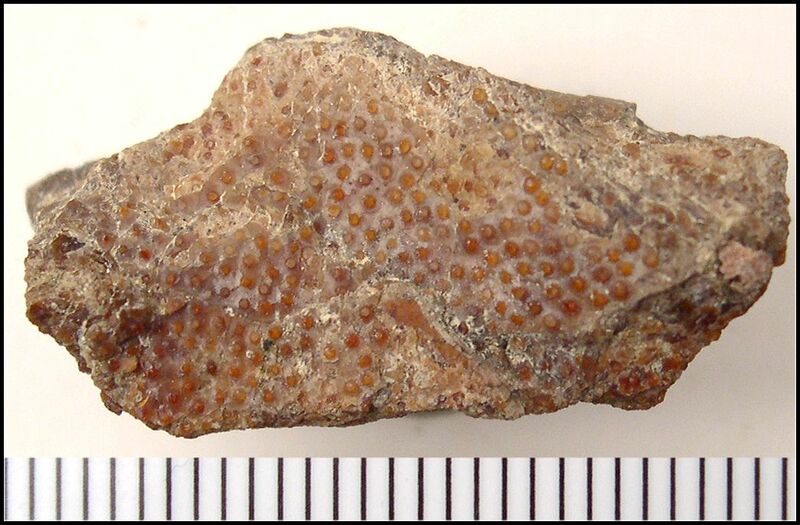 ), including both nares and a partial covering of dermal bone with sharp spines. Note that about half the people that I have shown it to suggest it is from a fish. Interdigitated sutures are clearly visible .... there is evidence of a distinct septum between the nares on the underside of the skull. No evidence of teeth or alveoli. So far as I am aware, nothing like this has ever been found in Kansas. Credit goes to Ken Carpenter and staff at the Denver Museum of Nature and Science for partial preparation. 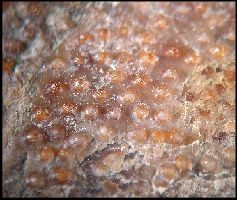 RIGHT: Anterior dorso-oblique view. The tip of the muzzle is missing. RIGHT: Ventral view from rear. 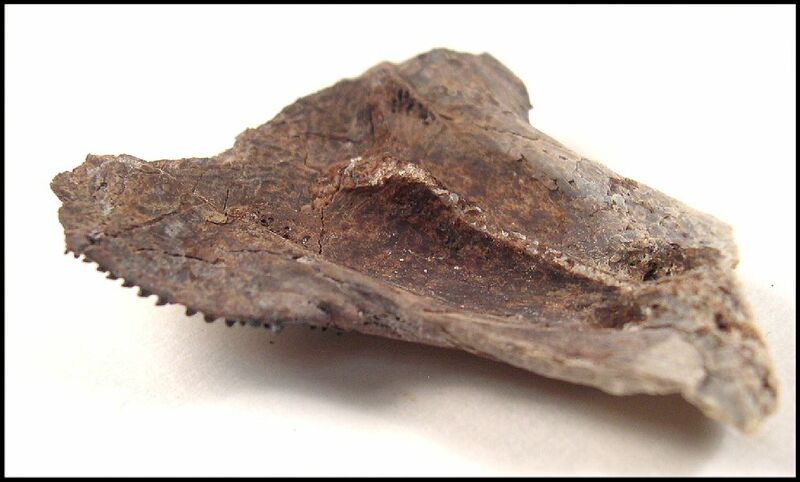 The remains of a "nasal septum" are visible in this and the picture at below left. LEFT: Ventral right-lateral oblique view. 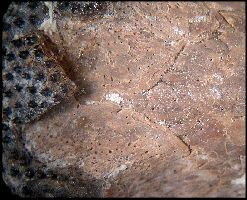 RIGHT: Close-up dorsal view near the center of the specimen, showing the sutures between a pair of bones, and an unpaired bone at the right. 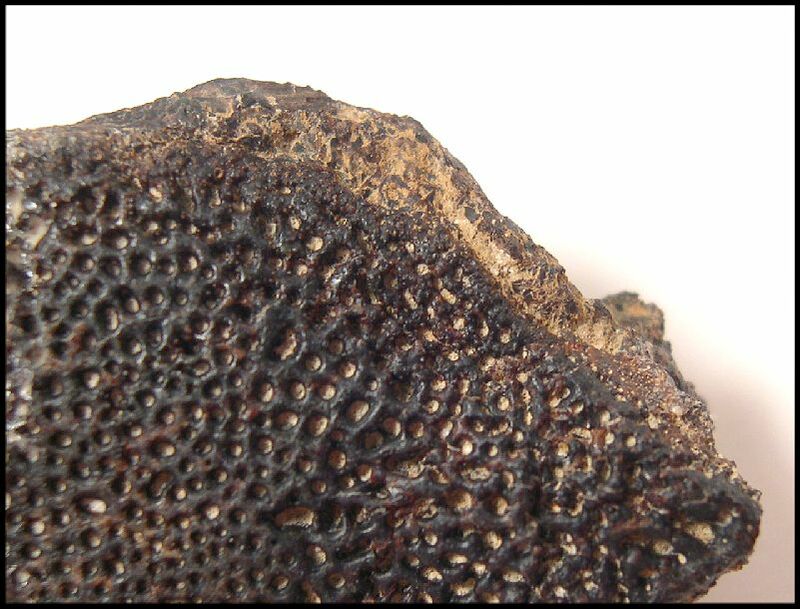 Also note the highly vascularized appearance of the bone surface. 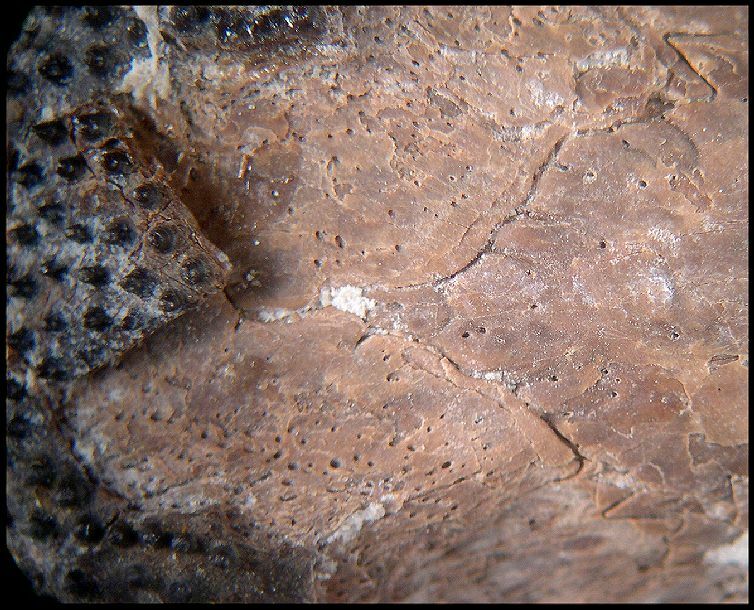 This area was probably covered with the dermal "bone" layer prior to weathering. 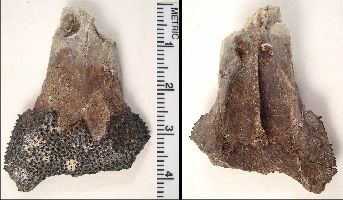 LEFT: Close-up of the right-rear corner of the specimen, showing the raised spikes, and also the pits that were under those which have been broken off. The spikes appear to be hollow, at least at the base. 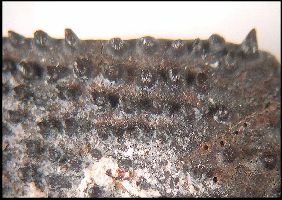 RIGHT: Close-up of the left-rear edge of the specimen, showing that the spikes occur in rows. 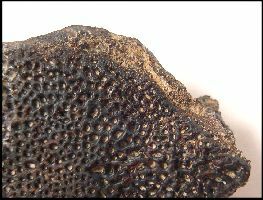 Most of the spikes appear to be worn smooth on top and are not pointed... but I think that all originally came to a sharp point. 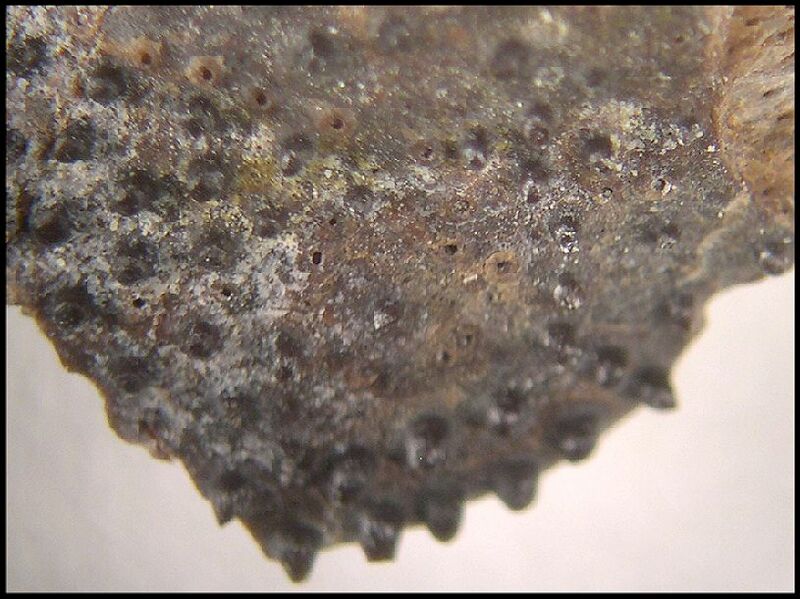 There appears to be some irregular ornamentation on the spikes. 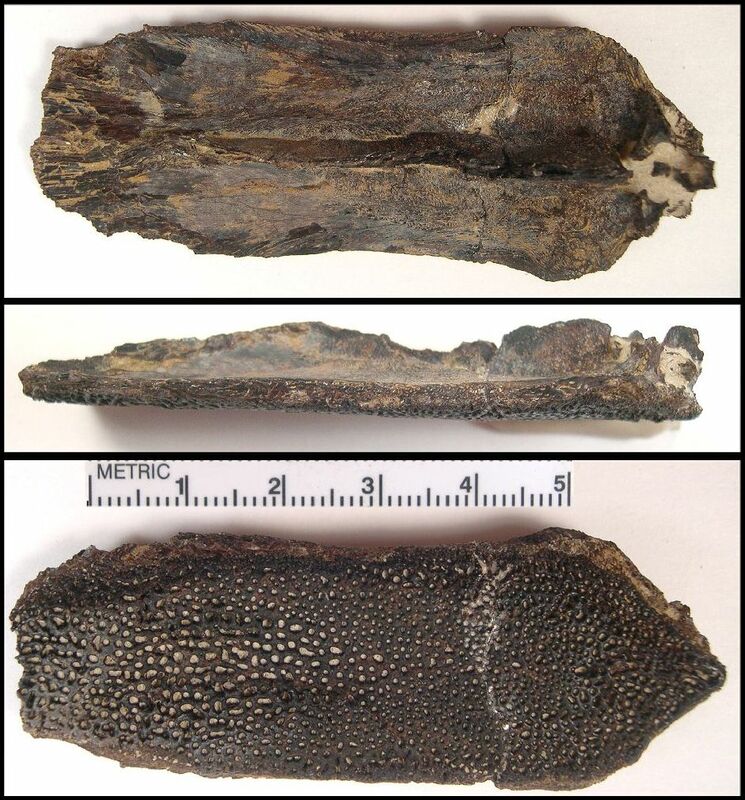 Suggestions to this point have included the suggestion that it is not a skull at all, or it's the skull of a small turtle, the skull of a gar-like fish (Lepidotes) or a sarcopterygian. Nothing really seems to fit all the characters. Any other ideas?? 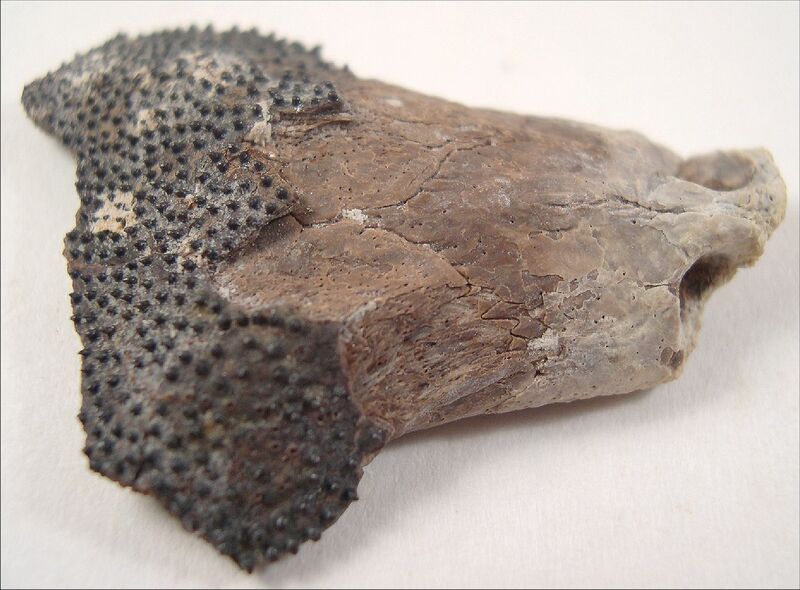 Some have suggested that the spines were actually teeth and the bone was the palatine of a fish. 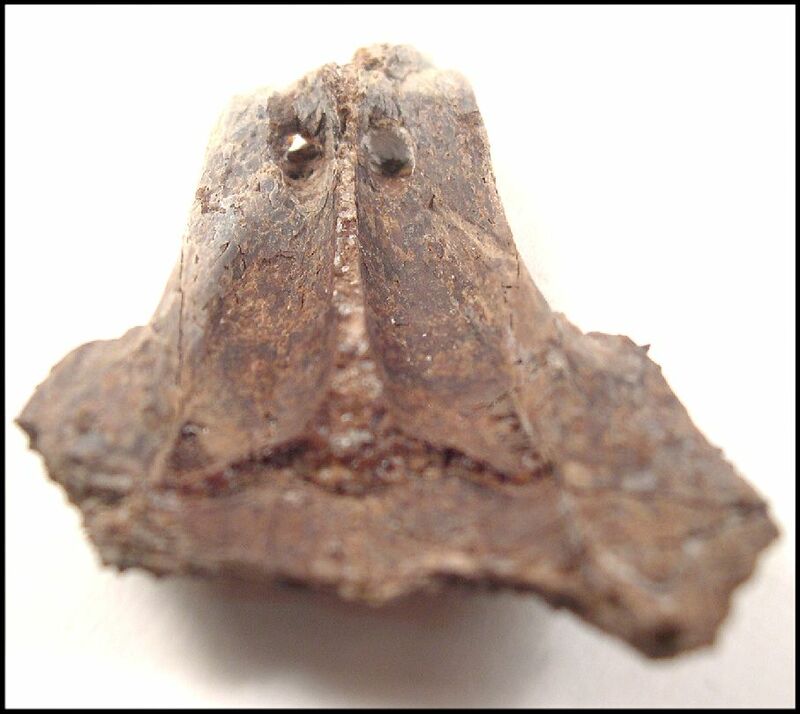 Shown below is a palatine bone of a plethodid fish from the Smoky Hill Chalk (Upper Coniacian). There are some similarities, and some major differences. Certainly not from the same family, but close in form and function? LEFT: A plethodid (fish) palatine in dorsal, right lateral and ventral views. 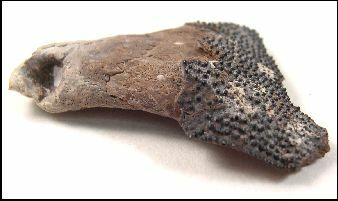 RIGHT: Close-up of the anterior end of the same bone, ventral view. Loomis, F. B., 1900. Die anatomie und die verwandtschaft der Ganoid- und Knochen-fische aus der Kreide-Formation von Kansas, U.S.A. Palaeontographica, 46, plate 19, figure 2. RIGHT: A close-up of the same fragment showing "teeth" that are very similar in construction to those found on the mystery skull.